Providing you the best range of adjustable backdrop stand with effective & timely delivery. 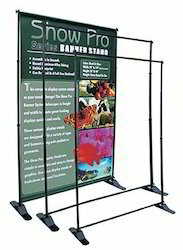 Adjustable Backdrop Stands is a highly portable product with adjustable size and height. They are widely used in events, seminars, exhibition stalls. They are a perfect tool for any company's branding activities. Size can be customised to your needs. It is a very cost-effective and highly impacting medium of advertising your brand.